Cylinders should be handled only by trained personnel. Cylinders that are not necessary for current laboratory requirements should be stored at a safe location outside the lab. Cylinders should be secured from tipping over by holders or restraints designed for such service. Double cylinder restraints (high and low) should be installed in a seismically active area. Cylinders in the laboratory should be equipped with a pressure regulator designed for hydrogen and marked for its maximum cylinder pressure. Regulators should be equipped with two gauges, installed to show both the cylinder pressure and the outlet pressure. Where the source cylinder is outside the lab, a station regulator and gauge should be installed at or near the point of use to show outlet pressure. Hydrogen supply lines should have a manual shutoff valve to allow isolation of equipment. A quick connect should never be used in place of a shutoff valve. Cylinders should be attached to an instrument for use by means of a regulator. Excess flow valves or flow restrictors should be used to control maximum hydrogen flow, particularly when using ganged cylinders. Connected through a regulator to deliver hydrogen gas to a laboratory operation. Connected to a manifold being used to deliver hydrogen gas to a laboratory operation. A single cylinder secured alongside the primary cylinder as the reserve cylinder. Cylinders not "in use" should not be stored in the lab. Hydrogen cylinders located outdoors should not be installed within 10 feet of windows, doors, or other building openings, or within 50 feet of ventilation intakes. Storage areas should have a minimum of 25% of the perimeter open to the atmosphere. This open space can incorporate chain-link fence, lattice construction, open block, or similar materials for its full height and width. Storage areas should be kept clear of dry vegetation and combustible materials for at least 15 feet. Cylinders stored outside should not be placed on the ground or on surfaces where water can accumulate. Storage areas should be provided with physical protection from vehicle damage. Storage areas can be covered with canopies of non-combustible construction. Check for compliance with local fire and building codes and storm water regulations for property line setback, threshold storage amounts, and berm requirements. Revise hazardous materials storage documents filed with local response authorities for any significant change in hydrogen or other hazardous materials storage. Post "NO SMOKING WITHIN 25 FEET" signs in gas cylinder storage areas. 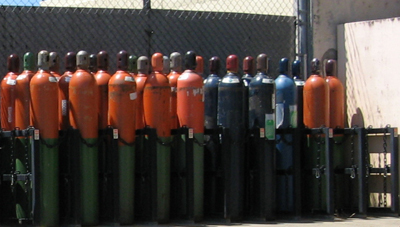 CGA P-1, Safe Handling of Compressed Gases in Containers, Edition 11, August 2008. LLNL's web-based training "DOE Hydrogen Safety". Module 3 - Pressure Safety (HS5094-DOEW).